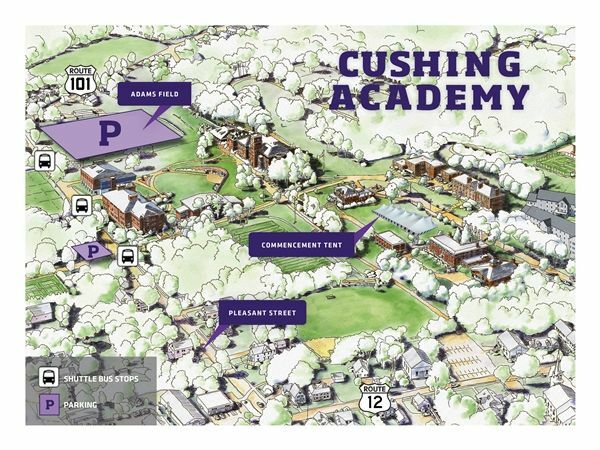 We look forward to welcoming you to Cushing's 144th Commencement, which culminates with the Graduation Exercises on Saturday, May 25, 2019. Follow this link for information on our keynote speaker, Dr. Mark Huddleston, President Emeritus of the University of New Hampshire. Friends and family members unable to join us on campus will have the opportunity to watch our live webcast of Friday's Awards Ceremony and Saturday's Graduation Exercises at www.cushing.org/live. Graduation invitations have been mailed to parents, including each family's tickets for two reserved seats in the special parent seating in the front. Each senior will receive ten additional invitations for guests and may request more invitations if needed. There will be ample seating under the tent for all guests, and no tickets are required for general seating. 6:00 - 7:30 pm: Graduation Dinner for the Class of 2019 and Parents. Each student may bring two guests (parents or other guests). Limited tickets for additional guests will be available as space permits. You will receive an electronic invitation and reply form in early April to let us know your attendance plans and to note any additional ticket requests. Friday night: Boarding seniors/PGs may leave with their families for dinner off-campus, following check-out procedures, but please note that they are required to stay on campus overnight for their final night at Cushing. 10:15 am: Senior Class Exercises. This is a brief gathering, with remarks made by selected representatives of the Class of 2019. Parents and guests are welcome. Senior Handshake: Following Graduation, the Class of 2019 will process from the tent to the Senior Walkway by the Main Building for the Senior Handshake with faculty. Departure from Campus. Seniors and their families depart campus following the luncheon (no later than 4 pm). Underclassmen remain on campus for final exams. The Awards Ceremony (Friday afternoon) and Graduation Exercises (Saturday morning) are held under a tent on Drew Common. Please be prepared for variable weather. Graduation invitations have been mailed to parents. Each senior will receive ten additional invitations for guests and may request more invitations if needed. There is ample seating under the tent for all guests, and a reserved section at the front for two special guests of each senior. Tickets for these two reserved seats were mailed to parents with the graduation invitation. No tickets are needed for general seating. Caps, tassels, gowns, and stoles are provided to our graduates. Graduates may keep their caps, tassels, and stoles. Gowns are to be returned immediately after the ceremony. If you or your guests will require additional assistance on campus, please contact Mrs. Colleen Fay, Administrative Assistant to the Head of School, at 978-827-7102 or cfay@cushing.org, for information about accessible parking, wheelchair seating, and shuttles on campus. Please be aware that only service animals are permitted on campus. Please note that Cushing Academy is a non-smoking campus. * For the safety and comfort of all of our guests, please be aware that only service animals are permitted on campus. * Please note that Cushing Academy is a non-smoking campus. The streets of campus will be closed on Saturday, May 25, 2019, until the conclusion of the ceremony at approximately 1:00 pm. Parking will be available at Adams Field, which is located at the intersection of Rte. 101 and Pleasant Street. Continuous shuttles will transport guests to the graduation tent on Drew Common. If you or your guests have mobility concerns, please contact Colleen Fay at 978-827-7102 or cfay@cushing.org for parking, shuttle, and seating accommodations. We recommend that families who live within a reasonable driving distance come to campus on an earlier date to pick up the majority of their student's belongings to help avoid crowding and traffic jams. We hope that families living a great distance from the Academy will encourage their child to start shipping belongings home early. If you are packing your car with your child's belongings on Saturday, we ask that you please refrain from doing so during the ceremonies. Owned and operated by Nicole Xarras Moorshead, Cushing class of 1989. Ask for special Cushing Academy rate. *Please note: Due to an update in the hotel's street address, some GPS devices do not currently provide accurate directions. If you are experiencing difficulties, please use the following: 150 Royal Plaza Dr., Fitchburg, MA 01420.